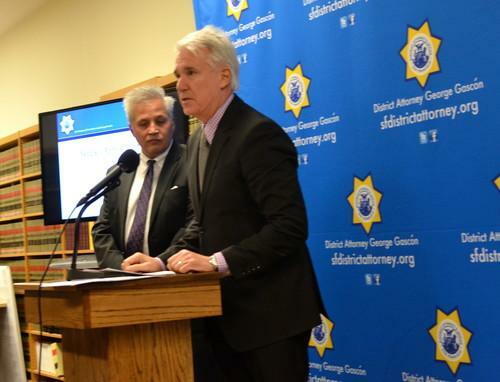 San Francisco district attorney George Gascon, speaking Dec. 4, 2013, during a press conference. "This is a really disturbing case," San Francisco District Attorney George Gascon told reporters Wednesday. What makes the case troubling, he said, isn't only that a man lost his life over a PS4 but that the murder happened near a park in broad daylight. The victim, 22-year-old Ikenna Uwakah, posted the PS4 for sale on Craigslist and on Instagram. It caught the eye of his alleged killer, 21-year-old Ronnie Collins, who police say lured Uwakah to the park in the city's Bayview district to make the transaction. Uwakah drove to the park with his girlfriend and was sitting in his car when Collins allegedly reached through the partially open window with a gun. Uwakah pushed the gun away and told Collins he could have the console but Collins shot him four times and fled, police said. Uwakah's girlfriend tried to drive him to the hospital but he was pronounced dead when they arrived. Collins was charged Wednesday with one count of murder and two counts of attempted robbery with firearm enhancement allegations. "This was a Christmastime predator," Assistant District Attorney Scot Clark said. Those using sites like Craigslist to sell products should take precautions to ensure their safety, especially near the holidays, Gascon said. "There might be a desire to sell whatever it is quickly to get money to purchase other items, but you really need to pay attention and be careful," he said. People should try to figure out who is trying to buy or sell an item, bring other people with them, and choose a public meeting place with lots of foot traffic, such as a shopping center, Gascon said. Because the public location didn't prevent this week's shooting, he suggested a police station lobby as a good meeting place. Red flags to watch for include items being sold for significantly less than they're worth, which could indicate they're faulty or stolen, Gascon said. The city has been lobbying the tech industry to come up with ways to reduce the market value of some products after they've been reported lost or stolen, to make reselling them harder, he said. IPhones and other smartphones in particular have led to a rash of serious crimes in San Francisco and other cities this past year.